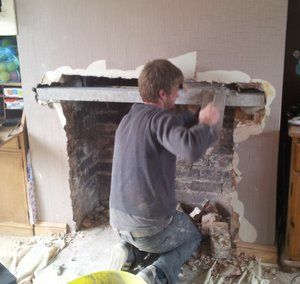 There should always be a lintel or arch above your fireplace/builder’s opening (to support the building material above). Sometimes you discover that an errant builder forgot. You can often find this lintel or arch by shining a torch inside your builder’s opening (assuming you have an opening or have started excavating) or removing plaster from the chimney breast or wall. In many properties a lintel will be non-combustible (concrete/slate/granite etc.) but in some properties a lintel will be wooden. Note that a wooden beam can present a serious fire risk: see Distance to combustibles. If the present arch or lintel is too high then you will need to fit a new one underneath the existing one (if the higher one is wood then it may need to be removed: see Distance to combustibles). Fitting a lintel is an easy task – buy a concrete lintel 4″x3″x whatever length required plus some and then cut it to length (ideally using a 9″-wheel angle grinder as a 115mm wheel will not quite get through) and ensure it is long enough to be well supported each end (4″ or 6″ overlap, see next paragraph). See picture above. Make sure it is level using a spirit level (you may use the lintel to attach your closure plate or register plate to at a later stage and having it completely horizontal makes the job a lot simpler). I also strongly advise making sure that you allow enough height for your hearth thickness PLUS the height of your stove PLUS 50cm (minimum). This will ensure that you have enough height above the stove to fit two flue-pipe elbows should you need to do this (if your stove is going to end up too close to the back wall leaving insufficent air gap to cover the stove manufacturer’s requirements). Too little gap and the elbows will not pass the lintel or will pass through the closure plate at 45 degrees which means you cannot use a sealing cover plate. Two offsets can require 35cm or more, so please make sure your lintel is high enough. Elbows-with-soot-doors require the most height (pictured is one elbow plus one elbow-with-door at 35cm length combined). A lintel that will end up 50+cm above the top of the stove will give adequate clearance should it be necessary (as it often is) to have two elbows above the stove without the lintel being in the way. 15 or 30 or 45 degree elbows all can be chosen from depending on how much offset is required. 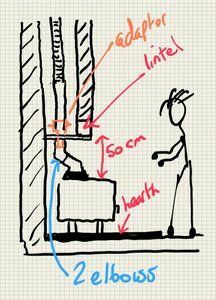 If you have between 35 and 50cm gap then this might still work but you’ll have to do lots of in-situ measuring (and do not forget the stove collar can be 0-10cm high). Concrete lintels are cheap (under £10). If you have discovered that there is no lintel in place or if you wish to add a lintel higher than the present one then you have to use common sense. If the chimney breast is brick and the opening no wider than one metre then I am happy to breakout and fit a new lintel without using acroprops. Any wider then I will use acroprops (see below). Stone properties: I will never breakout a recess in a stone property if I have not found the lintel and will never move that lintel or put one higher. I will always employ an experienced builder. Here’s the proper way of fitting a lintel using acro props: Fitting a lintel using acro props (exterior site). 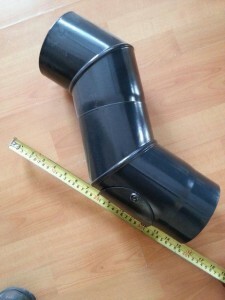 You might need to move your lintel higher due to adding a flue offset (as mentioned above). 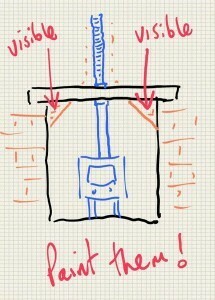 But you might find that this exposes the structural, interlocking brick “gather”. The gather is structural (is holding up what is above it using interlocking brickwork) and must not be removed except by a builder who knows what he is doing. Otherwise you can just paint them and live with them. 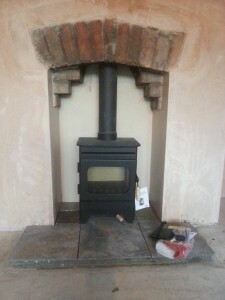 They will make fitting a chimney-sealing closure plate more difficult but it is all possible.